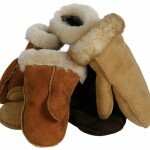 Made of 5/8" shearling with an elastic rim to fit most modern steering wheels. Keeps hands warm in winter and cool in summer. One Size: $29.99 Color: Assorted natural colors from Beige to black.